My husband and I are fond of walking along the Allegany River Trail. He’s a birder by marriage only, though he has become quite adept at identifying “green-headed ducks” (aka mallards) on the river. On one of our walks we had (at least I had) the pleasure of watching a pair of white-breasted nuthatches working the woods along the trail. These are one of a few birds that will move down a tree headfirst. 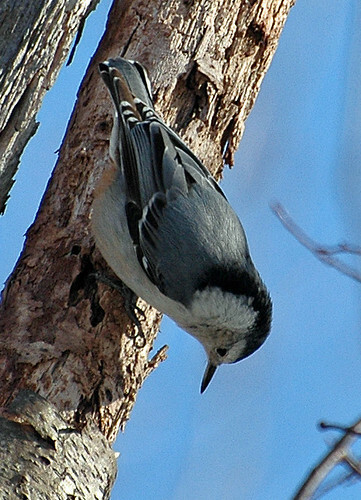 And unlike woodpeckers or brown creepers, their tail is short and not used for support while climbing or foraging. 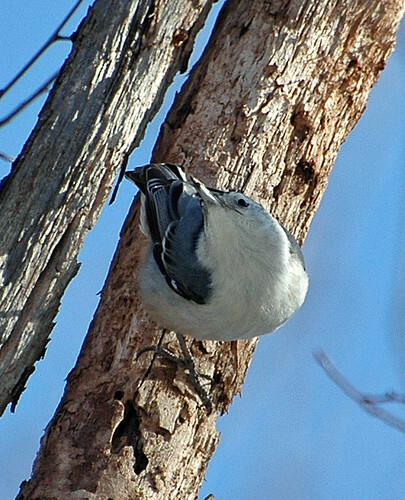 White-breasted Nuthatch – Nature’s Gymnast? What flexibility – I remember a picture of my sister from high school in a pose like this on the balance beam. A group of nuthatches is called a jar (who makes these up?). 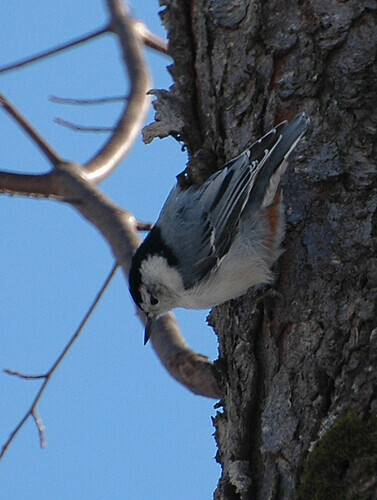 Guest post by Pat Coate on White-breasted Nuthatch. This entry was posted on 15 April 2010 by patacoate. It was filed under Nature . Excellent-yank, yank, I love these fellows! I didn’t know that about the jar!